I joined Nutracheck following the birth of my second baby in March 2009 when she was just two weeks old! The date of my wedding had been set for October 2009 and there was no way I was going to be a fat bride! My weight was at an all time high and I was a size 16-18. I had tried every diet under the sun before and I had failed miserably on them all, usually losing a few pounds then putting them straight back on plus more. I was determined that the Nutracheck plan would work for me. No faddy diet, no foods banned, just easy calorie counting and trying to fit in more exercise. This worked because I can have a bit of chocolate or glass of wine if I want it. No foods are banned, so if I want that bit of chocolate or a glass of wine then I can have it. I can have an easy day or cut down a little somewhere else or do some extra exercise. It's the balance that's worked for me. I know that if I go over my calories or have a bad day (even a bad weekend), it doesn't matter, as long as I get straight back on track. The excellent exercise tracker means that I love making up in extra exercise if I've gone over my food calories to still get a green tick. Don't worry about a bad day. It won't ruin your week. Get straight back on track and it won't matter! Get out and do as much walking as you can. It's free, you don't need fancy shoes and it makes you feel great. Walking has been pretty much my only exercise, but it has made so much difference to my weight loss and has improved my fitness massively. Don't deny yourself any foods. If you want chocolate or wine or crisps then allow for it in your diary. I always have Fridays as an easy day and I really look forward to my curry, glass of wine and chocolate bar. Have you reached any success milestones? Getting to my wedding goal weight. I couldn't believe I'd actually stuck to a diet, but it was so easy with Nutracheck! Then, I got to 10 stone 3 in time for my daughter's first birthday which meant I'd lost all of the extra weight from my two pregnancies a year after I started the diet. 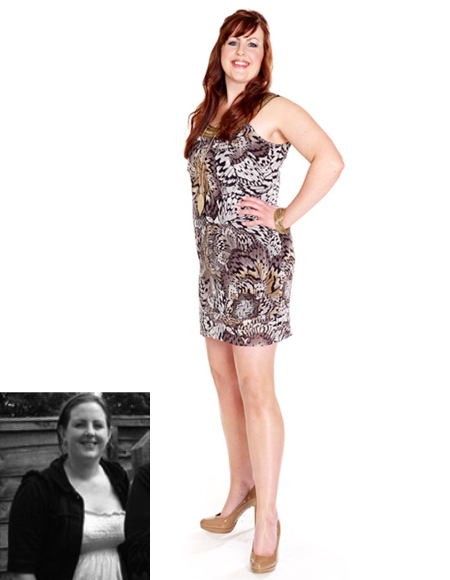 Before, I felt that being a mum meant I would be destined to be fat and frumpy. I've managed to become a yummy mummy and I'm able to wear gorgeous clothes! It has been hard at times. There are always reasons to eat more (and I will always love eating! ), but I know now that I have the tools to help me. If I have a bad week, I'm back on track the next to make up for it. I always continue my exercise no matter what. I have power walked my way through the bad times, good times, fat times and thin times! I feel fantastic about what I have achieved. My husband never thought I'd make it past the first month!